Carved study of a suggested pug x chow dog. Mounted on a slim line ash shaft with base metal ferrule. Silver /white metal collar currently untested for purity levels. 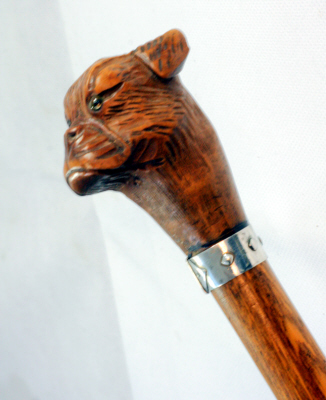 Excellent carved cane with minor wear for age. No breaks or damage. One of those studies that oozes character and attitude.